Monthly Happy Hours provide a chance to unwind and connect with fellow NCTA members. We were delighted to see a great turnout at our monthly get-together on a beautiful fall evening in September. It was also the day of the America’s Cup final race—no wonder there were so many people at the waterfront! 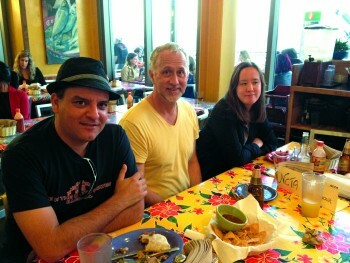 Among the tourists and spectators, we spread out at a long table at Mijita Cocina Mexicana. Along the table were many friendly faces of veteran NCTA translators and one fairly new member. We talked about topics from the world of translation, current events, and world politics. kim posted this article under NCTA Events	on Thursday, May 1st, 2014 at 12:07 pm	You can follow any responses to this entry through the RSS 2.0 feed. Both comments and pings are currently closed.